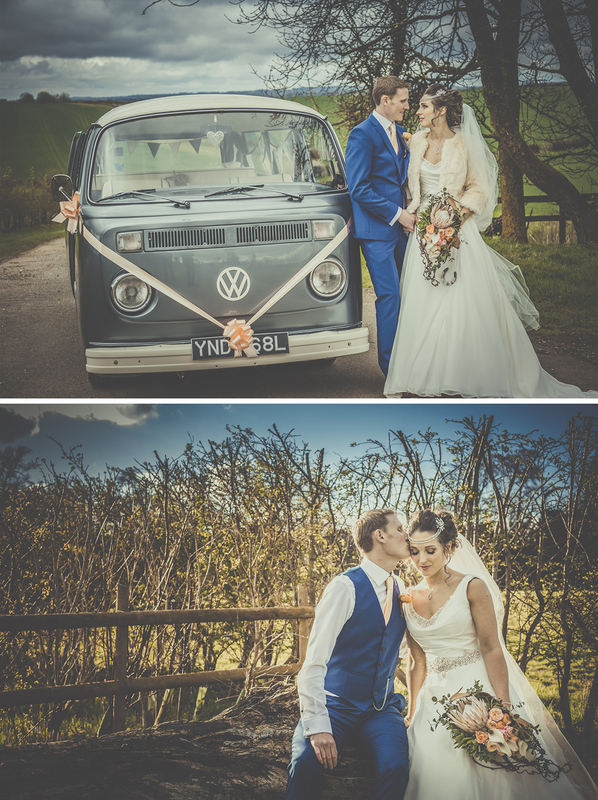 Larissa and Sam’s spring wedding at Clock Barn was peach perfection. 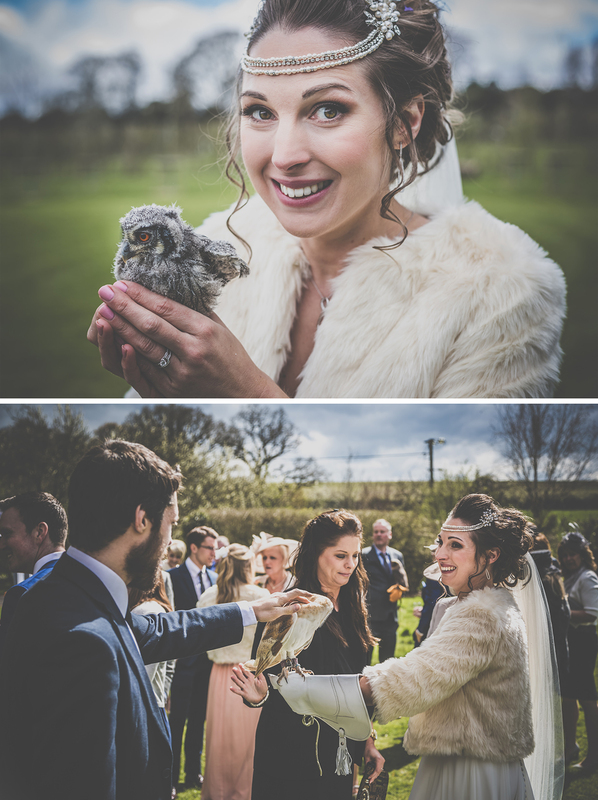 Full of personal touches and fabulous DIY details, it was a day that definitely created the atmosphere of ‘love and happiness with a touch of sparkle’ that Larissa and Sam had planned so carefully. Rather than conforming to current trends or trying too hard to create a Pinterest-worthy day, Larissa and Sam instead opted for a wedding that truly represented their lives together. 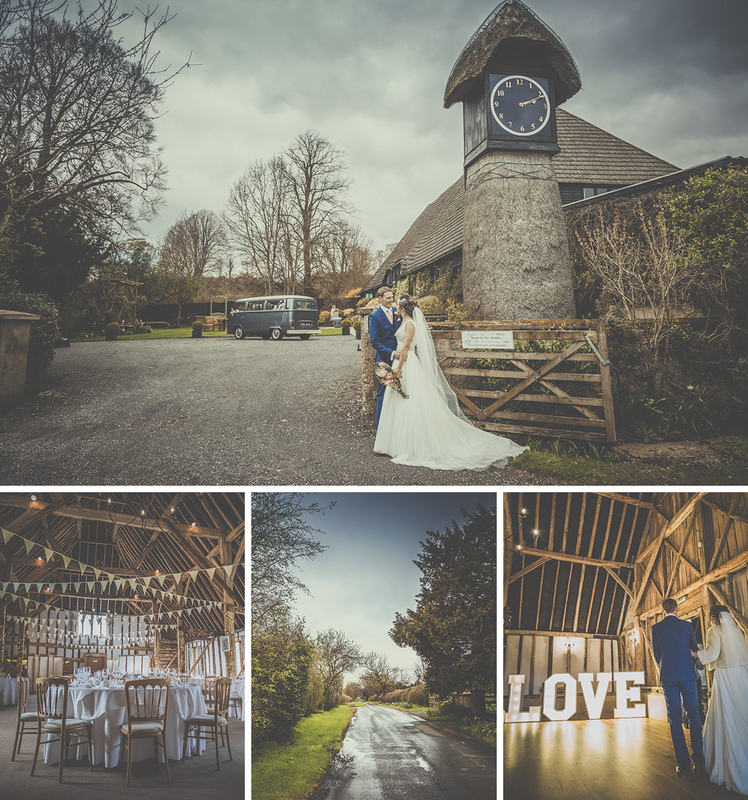 After seeing lots of barn wedding venues that ‘didn’t quite tick the box’, Clock Barn was the last venue the couple visited. It was love at first sight and Larissa admits to having tears in her eyes as she pictured her wedding. 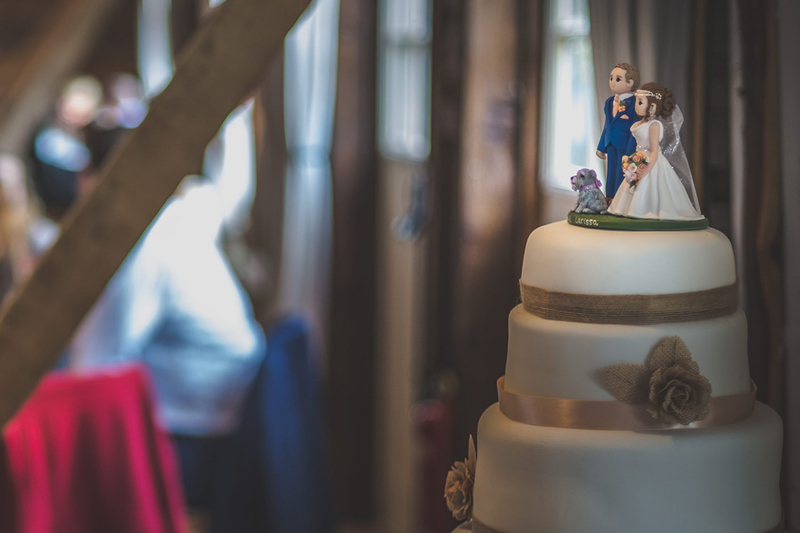 It was also meant to be as the only Saturday that was still available in April 2016 was the exact date that the couple had hoped for! “Clock Barn had it all from the second we drove through the gate. A beautiful winding driveway through fields, easy parking, beautiful gardens and the paddock with the cute outbuilding for photos. 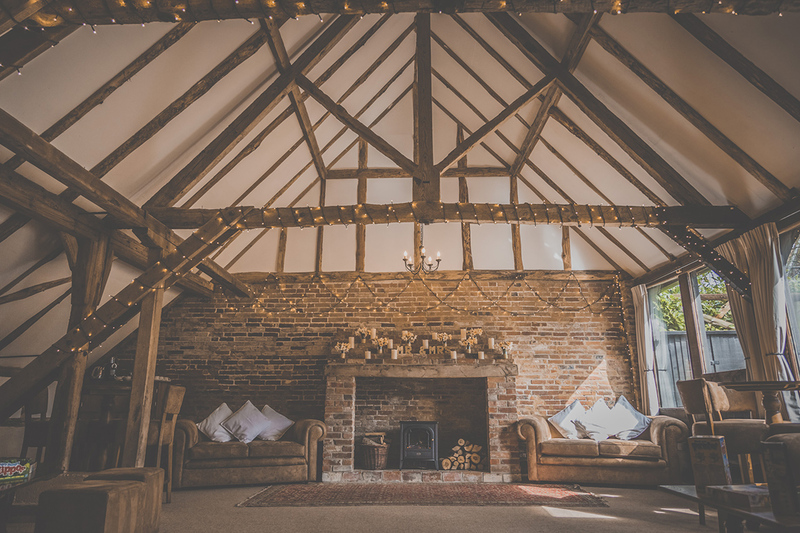 As soon as we walked in, it just felt so welcoming and had the ‘wow’ factor I had only dreamed of having! The staff too were so welcoming and friendly, I knew they could help us create our perfect day.” – Larissa. 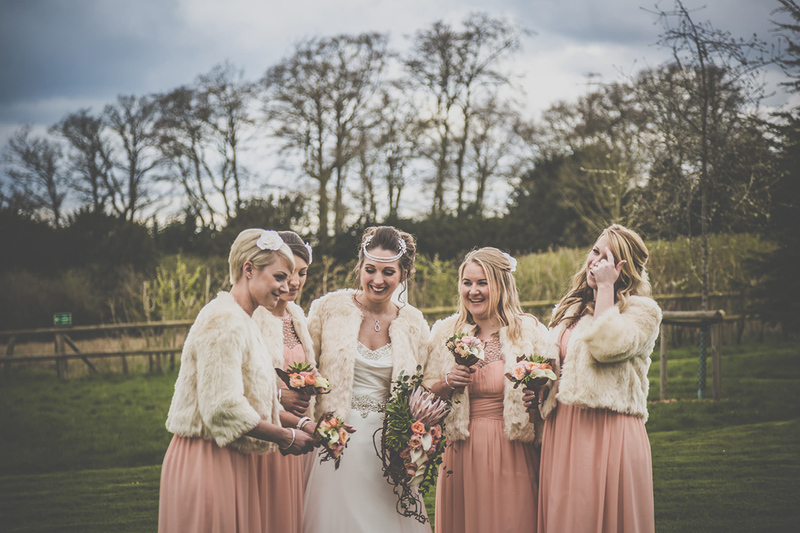 Larissa and Sam chose a pretty peach and hessian theme as it was perfect for the time of year and the look of the barn. 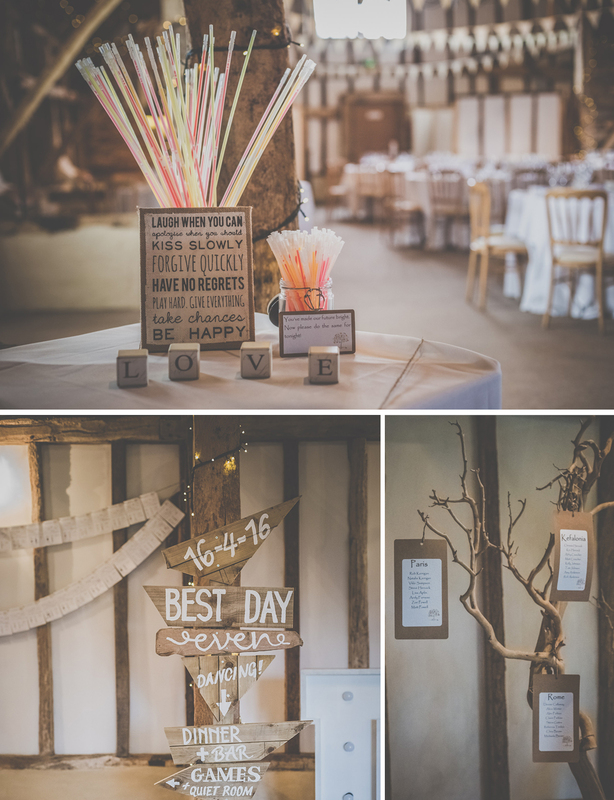 However, they also incorporated lots of details that were important to them and there were plenty of homemade touches including stationery designed by Sam. 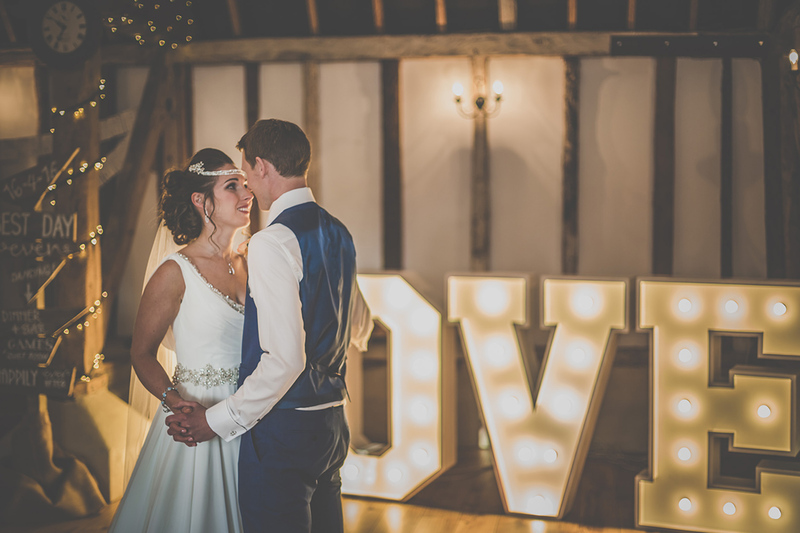 Everything worked absolutely perfectly with the rustic wedding barn and the finished look was adored by all of the couple’s guests. “All of the special touches will remind us of us and the people we have in our lives past and present. My Dad always loved cacti, we had quotes because I love them and we could then display these in our home, we had a 5 tier homemade cake (Sam’s a very keen baker) and all our tables were named after places we’d visited together.” – Larissa. Larissa wore a gorgeous gown by Ronald Joyce. With beautiful back detail, sparkles, covered buttons and flowing train, it looked fabulous teamed with a cathedral length veil, decorated with extra sparkles. She also wore a Swarovski infinity symbol back necklace and a bespoke headdress by White Design. Larissa also personalised her Rainbow Club shoes with sparkling shoe clips and blue diamante ‘I DO’ stickers on the soles. Sam wore a blue suit by Moss Bros and the couple picked up suits for Sam and all the groomsmen in the January sales. Peach ties and pocket squares worked so well with the theme and Sam also wore infinity symbol cufflinks. “I bought my bridesmaids bracelets engraved with ‘Always remember… never let anyone dull your sparkle’. It’s a bangle I have myself and love the quote as it’s a good staple to live by!” – Larissa. 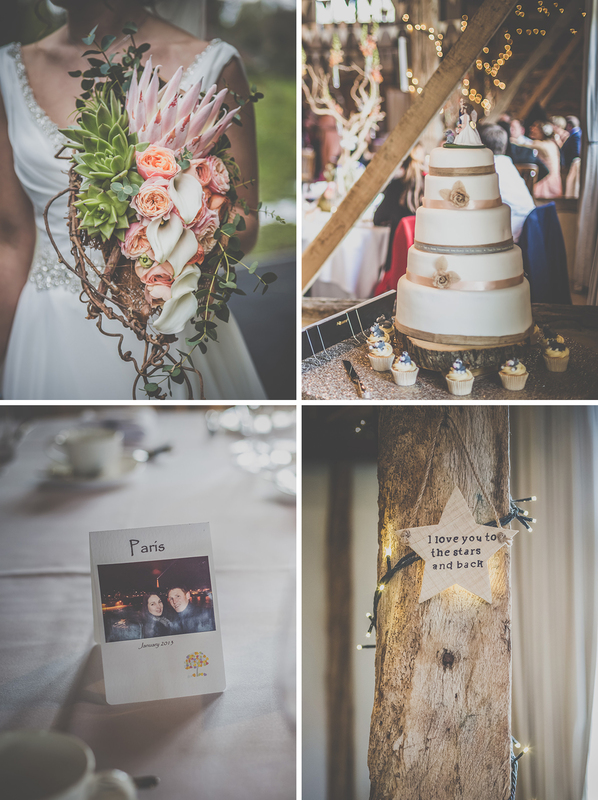 Larissa and Sam worked with ‘floral sculptor’ Owen from Little Lillies who created the most amazing floral displays and a brilliant bridal bouquet that included airplants, succulents, a big King Protea, Calla lilies and roses to name but a few. 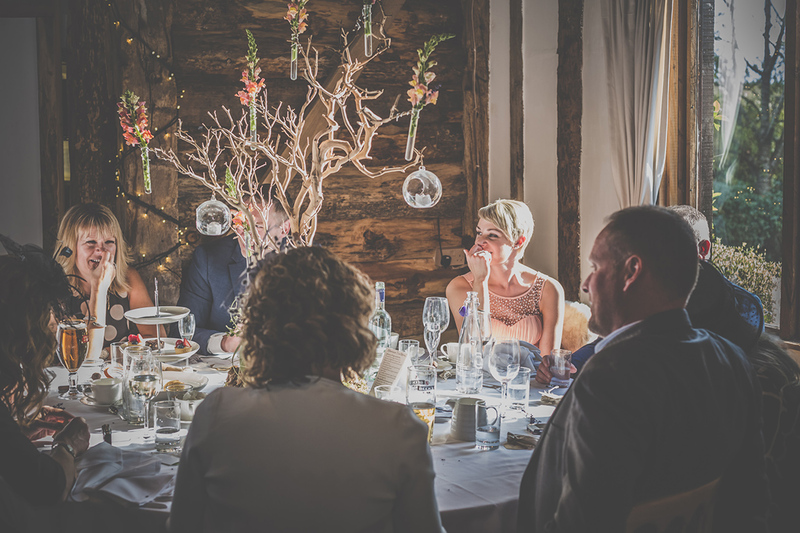 As well as the Manzanita tree table centrepieces that were decorated with peach flowers in test tubes and battery operated candles hanging from the branches in glass baubles, Owen also created a truly superb table plan. Larissa has since replanted succulents from her bouquet at home. “We also had a wall of origami paper cranes in assorted colours. 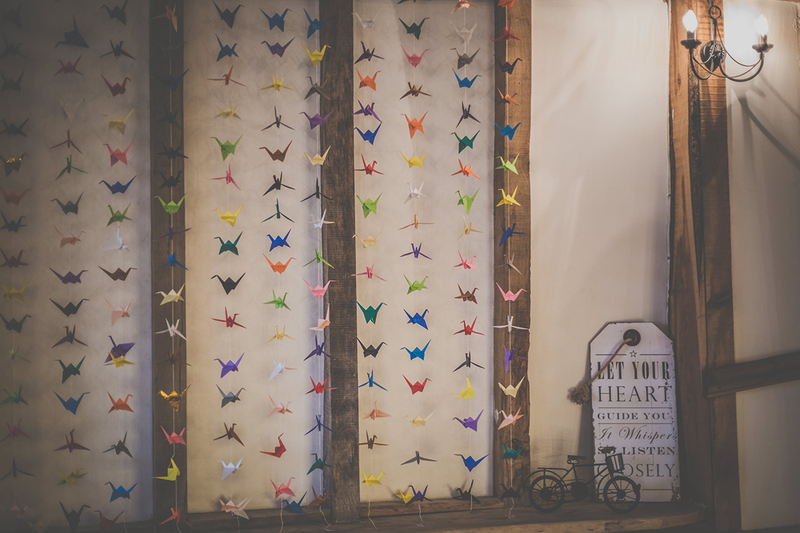 I’d read that it’s a Japanese tradition to fold 1000 paper cranes to bring good luck to the bride and groom – we made it to 500 and it looked great!” – Larissa. 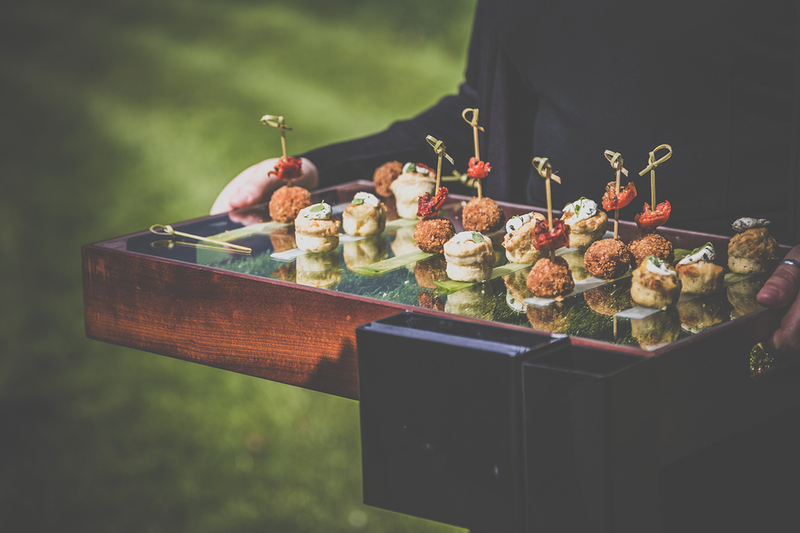 The couple and their guests were totally wowed by Galloping Gourmet’s afternoon tea while their evening food of fish and chips in cones plus Pimms arrival drinks gave their feast a traditionally British flavour. There was also the cake, made by the groom that included layers of chocolate, lemon, chocolate orange, rum and raspberry and fruitcake.